The now half-forgotten genre of Lancashire comedies was one of the mainstays of British theatre in the first half of the twentieth century, but one play from that fold has more than stood the test of time, retaining its popularity as it keeps being discovered by new generations over a century after its premiere; Hobsonâ€™s Choice. Many of the issues within the context of the play are now very dated such as the position and expectations of women and the levels of deference between both salesperson and customer, employer and employee (or master and servant to use the parlance of the time). However, the characters are all very believable and their respective hopes and aspirations resonate very much with us today, even if the contexts may differ. Hobsonâ€™s Choice is also an interesting time-capsule of a bygone age. Salford Arts Theatre is of course located in the very vicinity of where the play is set and the enthusiasm of all the cast in telling a local tale is strongly evident. The presentation is bold and imaginative, unusually using a combination of both proscenium arch and in-the-thrust theatre. Directed with a constant pace by Roni Ellis, there are many nice touches including a trap door leading up from the work shop which not only works well as a set-device but nicely brings over the â€˜upstairs-downstairsâ€™ social conditions of the time. The costuming is excellent, particularly with this being a large-cast play, although for a story set in the 1880â€™s, some of the stripy styled outfits do look somewhat Edwardian, but thatâ€™s a minor point. This is a play where the central characters go on deep personal journeys and Joseph Walsh as young Willie Mossop superbly brings over an unambitious underlingâ€™s gradual transformation in an amusing way, worthy of the great Norman Wisdom. Lyndsay Fielding as wife-to-be Maggie Hobson measures assertiveness with conviction, very much a picture of the kind of women at the time who refused to accept the status quo. Scott Berry reinterprets many peopleâ€™s image of a well-built Hobson (popularised by Charles Laughtonâ€™s interpretation in the 1953 film), but this slim-line Hobson is perhaps more historically accurate and all the emotions and reactions to his ever changing circumstances are convincingly well-observed. The rest of the cast provide an effective array of Victorian personages, with Paul Worrall and Christopher Wollaton each playing two very contrasting characters, including Paul presenting a very dapper young man whilst sporting a fine period-moustache and Christopher effecting a superb Scotch accent comparable to Gordon Jackson in Upstairs Downstairs. Connie James as Vickey and Elka Lee-Green as Alice offer interestingly different characters to their head-strong sister Maggie Hobson, at times almost coming over as a comedy duo. Not to be overlooked are Steve Cain as the memorably amusing Timothy Wadlow (clearly in the cannon of Roy Kinnear) and Emily Cox as Ada Figgins, very much a woman of her time and society. Hobsonâ€™s Choice has something of a feel-good factor about it, showing people overcoming social and economic challenges to achieve what they want for themselves, although this no Dickensian attempt to draw attention to any societal wrongs. The play is very funny but not without its thought-provoking moments and Salford Arts Theatre have done an all-round excellent job in breathing new life to an old classic with strong local connections; a fine piece of entertainment. 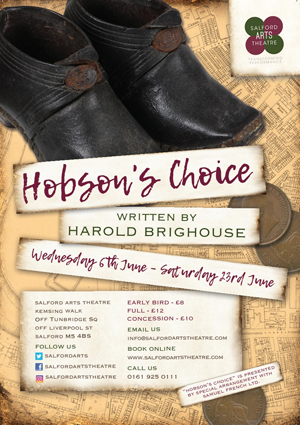 Hobsonâ€™s Choice is on until Saturday 23rd June.